O my Lord Krishna I beg to offer my prayers unto you. My mind is like the bee, and it is after some honey. 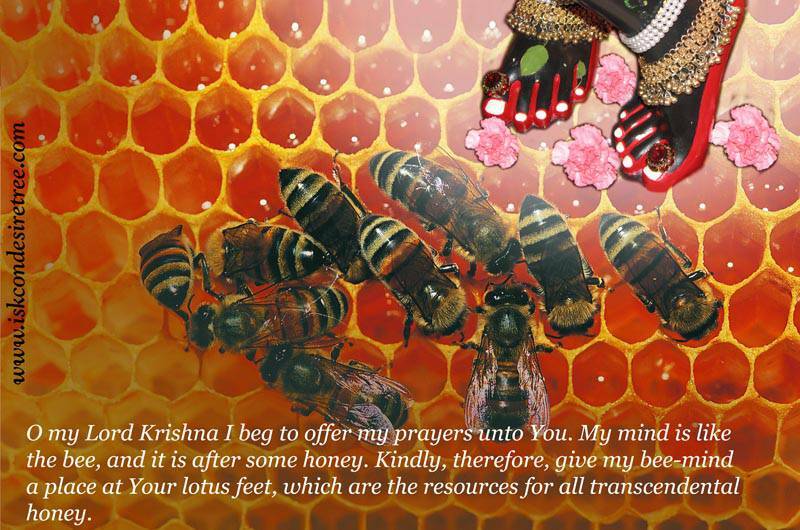 Kindly, therfore, give my bee-mind a place at your lotus feet, which are the resources for all transcendental honey. 0 handsome Lord Govinda, we happily bow down to offer our respects to you. Please be kind and give us a drop of the pure love that completely eclipses the moon of nondevotional philosophy. The best prayer- "Krishna I am yours. How can I serve you?" Oh dear Lord, Let those who misrepresent you not disturb my faith in those who represent you properly. The foundational prayer of our movement by Srila Prabhupada is to become a puppet in the hands of the Lord. When we take credit for what we do our strings are cut.